The Cambodia Peace Museum is raising funds to purchase a unique sculpture created through the Peace Art Project Cambodia, transforming weapons into works of art that promote peace and unity. This has been an inspiring year for the Cambodia Peace Museum project. Thanks to our new partnership with the Friends Economic Development Association (FEDA), we have secured a site for the museum in Battambang. Construction began in September 2017 with the target to open the museum to the public in 2018. As we move into this exciting next phase of the museum, we are cultivating our archive collections to create dynamic, informative and inspiring exhibits that will celebrate the incredible achievements of Cambodia’s peacebuilders. To that end, we need your help! 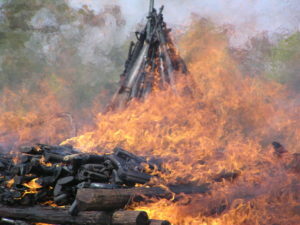 One such exhibit will highlight weapons reduction work in Cambodia. A central piece of this work was the “Flames for Peace” ceremonies wherein communities would collectively turn in their guns and ammunition, using the ceremonies to symbolise each community’s decision to turn away from violence to peace. From the weapons reductions and destructions, the Peace Art Project Cambodia emerged: Working with Cambodian artists to turn the destroyed weapons into sculptures as a way to both remember the past, and to transform the machinery of violence into works of art. 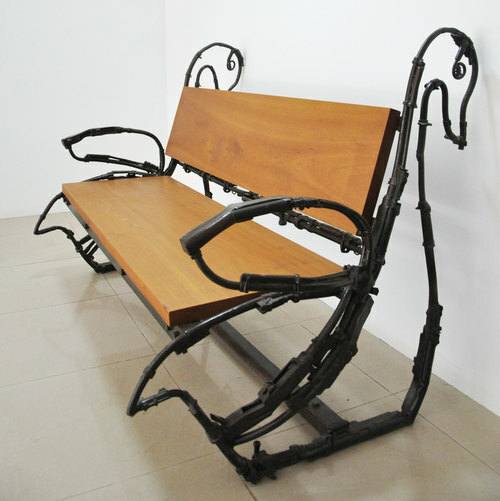 The Swan Bench (pictured above) was designed by OU Vanndy from AK-47s destroyed during the Flames for Peace Ceremony in Kampong Cham in 2004. Vanndy has become a well-known Cambodian artist, expressing strong social messages through his artwork such as a mural project about HIV awareness for UNESCO and UNICEF and a UNDP project celebrating achievements in Cambodian landmine action in 2009. His Peace Monument design, “Naga for Peace and Development” was chosen, created and is now permanently sited in Battambang town, using weapons collected from Battambang province. To purchase this unique piece, one of the last sculptures available from the Peace Art Project Cambodia, the Peace Museum needs to raise $6,200 by December 31, 2017. We have already raised $3,750 towards our goal, more than half of the funds needed to secure the Swan Bench has a permanent home in the museum! Online donations through our partners at East West Management Institute, which are tax-deductible for U.S. taxpayers. Contact us to make a transfer to our Cambodian bank account. Thank you to all our friends and partners who helped us to reach our fundraising goal. The Swan Bench was successfully purchased for the museum and will be on display to the public when the museum opens in 2018.